Make sure to drop by alt.tv.pretender We're won't bite, I swear. Quotable Kyle: Click to View or Add Text. Age: Unknown; but younger than his brother, Jarod, who is in his in his late thirties. was awarded the distinguished Flying Cross, of which he gave to his son (Kyle) before he was abducted by the Centre. Assumed to be on the run from the Centre for thirty plus years. 'Amnesia' -- First aired ?? Jarod won`t finish a simulation unless he is able to meet with a boy (Kyle) he passed in the hallway - Jarod wants a friend. Jarod and Kyle meet for the first time as young boys. A young Jarod asks Kyle "Where are you from?" "Do you know who you are?" Kyle sims the assassination of Dr. Martin Luther King Jr. - a first for "I decide who lives or dies"
Kyle is taught to hate as he shoots at an image of Mrs Parker. "Feel the (hate) grow" Mr. Raines tells him. Kyle says he feels safe at the 'Dragon house'. After being taken hostage by the Centre once again, Mr. Raines - knowing that Kyle remembers too much - has Kyle readied for a frontal loab seperation. indicate that this man even exsisted. All Wild cards -- Phrase said of Kyle by the prison guards; refferring to Kyle`s unpredictible behaviour. Kyle escapes his handcuffs and 'plays' with the prison guards minds. Guy - Bit his nose off his face; (Kyle) said he didn`t like how the guy used it to look down on him. Harriet Tashman - Took her hostage twice, both times for information involving his parents' whereabouts. The first time Harriet intentionally crashed the car Kyle held her in. He was injured in the crash and taken to prison where he'd spend the next ten years of his life. The second time Kyle abducted Harriet he hooked her up to a car battery in order to shock her into telling him about his parents. Prison Guards - Sent to the bottom of a pond in a prison van with only and inch of air keeping them alive. Taxi Driver - Driver was insistant that Kyle put out his cigarette in his cab, Kyle didn't like this so he tied the guy to his seat in the cab, taped his eyes open, and his mouth taped shut. Kyle faced the taxi toward a tunnel ontop of railroad tracks. To complete his terrorizing of the cab driver, Kyle put out his cig on the cabbie`s tongue. Luckily, a passerby found the taxi driver before the next train did. When found, a doctor told the FBI that the driver was "scared nearly to death". Mr. Lyle - had his side sliced up by an information seeking Kyle. Also, during a standoff in which Mr. Lyle took Miss Parker hostage, Kyle shot Lyle in the shoulder. 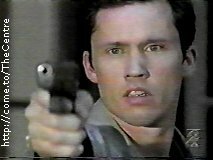 The shootout ended in a heroic attempt on Kyle`s part to shield Jarod from an oncoming bullet fired by Lyle. It was there that Kyle lost his life.